There’s a lot to be said for the first half of our journey. Still, there’s a lot more to be said for the second half. As we entered the Highlands, we knew the climbs would get longer and the views would get more spectacular, but we weren’t prepared for just how impressive (and tiring) it was. We woke early the next day and quickly reconvened in the centre of town to swap contrasting stories of our lodgings. Apparently those that chose the B&B were treated to a full Scottish breakfast, whereas us hostel-goers had to content ourselves with another Snickers. That detail aside, the mood was improving greatly. It was sunny and the warmest it had been yet plus our various illnesses seemed to be subsiding, so we located the trail once again and set off towards the hills and mountains that rose before us. The previous day had ended with a long descent into Crianlarich, so this meant we had to begin today with a long climb just to get back to where we had left the trail. Better this than the other way around I suppose. I spent the morning (and previous three days) pointing out to my increasingly frustrated companions that I had avoided the blisters and sore feet they had been struggling with. But, in an example of restoring balance to the universe, I quickly rolled my ankle over and was forced to struggle and limp for the next couple miles. Still even this couldn’t dampen our spirits as we made our way up and down through heavily wooded hills. We also encountered, for the first of many times, two Swedish hikers (a man and a woman). They were both traveling alone (this will be important later) and we must have awkwardly switched the lead on the trail at least ten times that day alone. We left the woods behind and continued on the road to Tyndrum. As we marched through an idyllic valley, we felt truly removed from Glasgow for the first time. There was a smattering of farms mixed in with ruins and relics of either Medieval times or the bygone Scottish clan era. With the hills enclosing us on either side, we felt as if we had stepped into a region forgotten by the changing world outside. Eventually, we reached the village of Tyndrum, a transport hub of sorts. While a couple days ago we might’ve been tempted to hop on the train straight to Fort William here, we confidently brushed the option aside and pressed on after a short break. 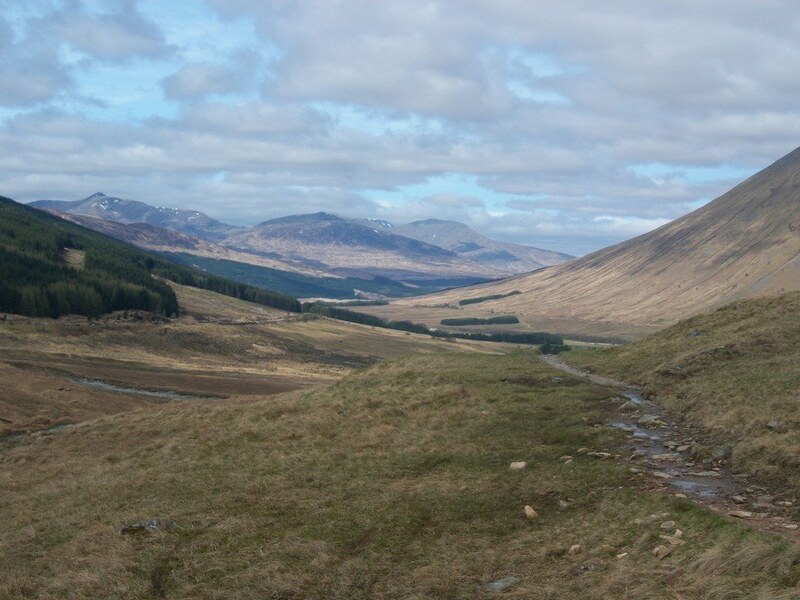 Our goal was to reach what we assumed was the town of Inveroran by way of Bridge of Orchy. As soon as we left Tyndrum, all signs of civilization (besides the occasional sight of a distant road) melted away. The rolling hills gave way to mountains in the distance as far as the eye could see. Trees were few and far between as we continued walking in the shadow of these towering cliffs. We reached the small village of Bridge of Orchy; crossing over the River Orchy on a bridge I can only assume was named the Bridge of Bridge of Orchy. In what seemed like record time, we only had a couple miles remaining on our trek. Maybe it was the weather, or the fact that it was a much shorter distance than the previous day’s death march, but the walk had flown by with the sun still shining high in the sky. Bridge of Orchy I presume? The last leg of the day’s journey took us up the highest peak in the region, which afforded one of the most spectacular views we had seen so far (only rivaled by Conic Hill). As we took picture after picture to prove we hadn’t given up, we noticed that the route north (which we would take the next day) appeared to be on fire. I don’t mean someone was having a campfire; there were plumes of grey smoke rising from behind the hills. 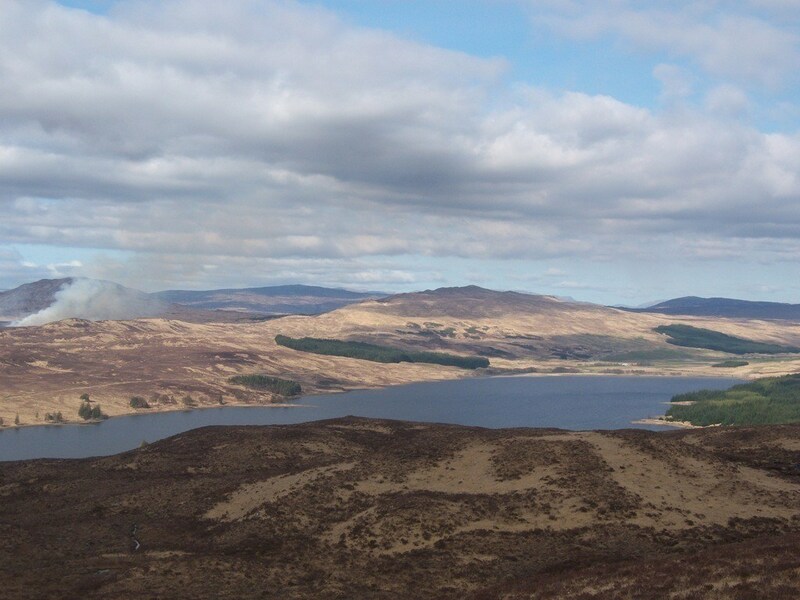 As we wondered who on earth was around here to put the fire out, we descended onwards toward Inveroran. While the guide made it sound like a town, Inveroran seemed to be a pub and that was it. Don’t get me wrong; if you’re going to build any building, it might as well be a pub, but we expected a bit more. With no visible place to hunker down for the night, we set our tent up a little ways down the road, on the edge of Rannoch Moor. There are probably more spectacular places to make camp somewhere, but I’ll believe it when I see it. Disregarding the fact that we were camping out on a British moor under the full moon (when has that ever hurt anyone? ), we may or may not have let our school bartender know where we were (anyone have cell service?) and headed towards the pub to eat. After entering the special side area for backpackers (because we can’t mix with the general population), we were treated to an amazing home cooked stew and pints of beer. Unreasonably proud of our days work, we staggered back down to road and settled in for the night. I knew something was wrong when I woke around 4am. As I tried to figure out what I had done to deserve being awake right then, I realized the lower half of my body was soaked. I know what you’re thinking, and believe me, it was my first thought too. After trying to come up with an explanation for my friend with whom I shared our awkward tent alcove, I noticed his discarded water bladder in the corner (the massive sacks of water with a nozzle we could stick in our bags and constantly drink through without the hassle of getting a water bottle out). During the night, the thing had burst, giving the sensation of sleeping with half your body in a stream. After realizing I didn’t care to do anything about it now, I went back to sleep. What seemed like minutes later, we all woke ready to start the next phase of our journey. After assessing blame where it was due for the water incident, we prepared to pack our tent up. We had come to hate the unwieldy thing by this point, with the polls especially weighing our bags down considerably. So in the true spirit of preparedness, we decided to throw our now partly soaked tent and equipment into its bag and onto the side of the trail near the pub as a gift for any traveler who wanted a free four (or five) person military tent. 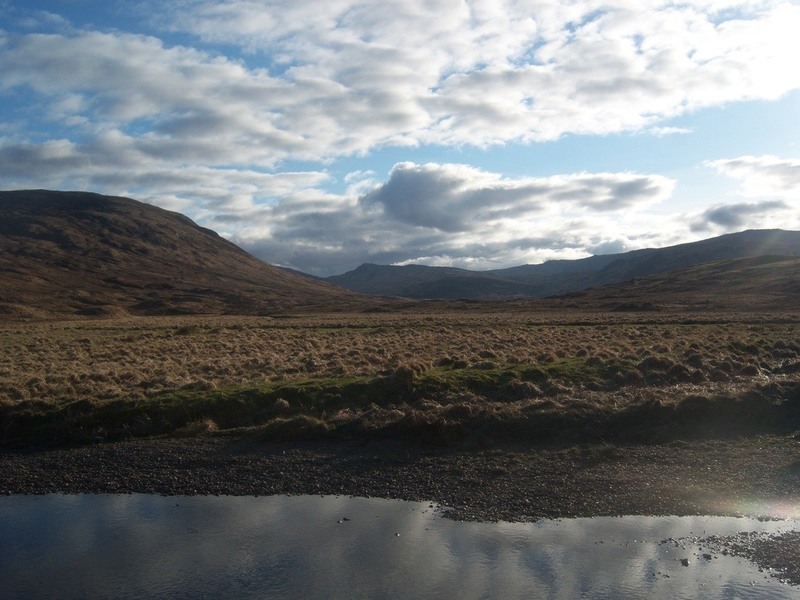 We set off into the desolate Rannoch Moor to start what would likely be our most difficult day. While it wasn’t quite the longest, the climbs were getting bigger, our limbs were getting weaker, and there was something called the Devil’s Staircase in our future. Just when we started to feel sorry for ourselves, we passed a scraggly, bearded man with no shoes going the opposite direction. After our encounter with Highland Jesus, we made it to the area of the moor that had been on fire only yesterday. The land was now a blackened and charred mess of dry brush (you can probably see how fires are a danger out here). The far edge of moor treated us to small, glistening ponds, and more spectacular views over what were officially now the Highlands. 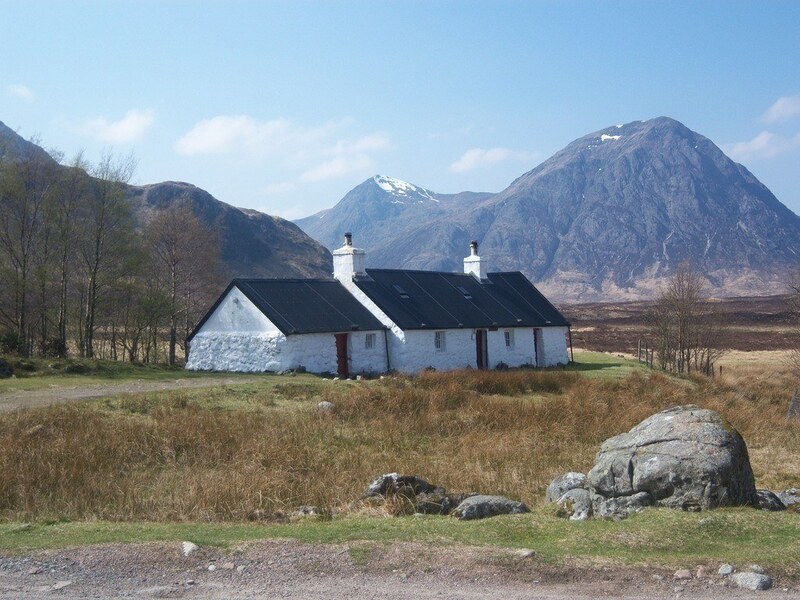 As we rounded the corner towards Kings House Hotel (or day’s midway point), we came face to face with Glen Coe. Glaciers and volcanic activity formed Glen Coe long ago, and the result is probably the most spectacularly impressive and beautiful place in Scotland. 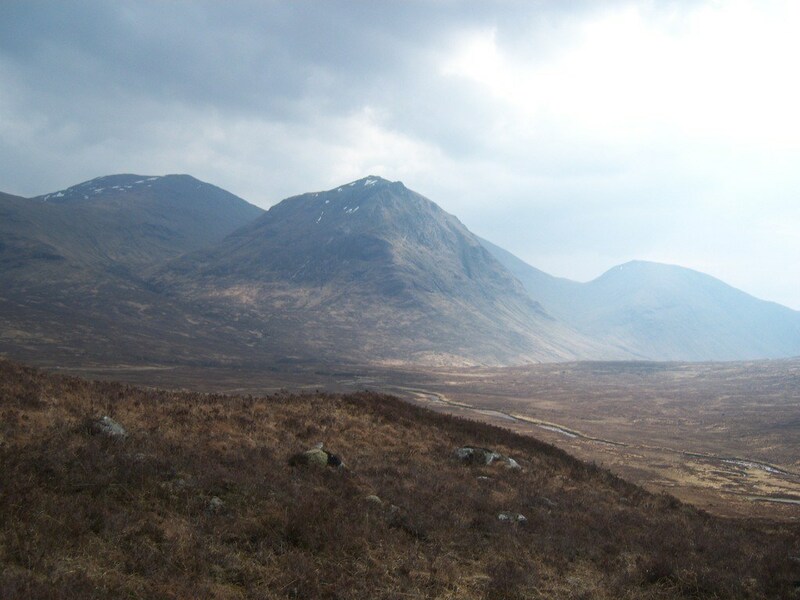 While there were elements of civilization (including the A82 road and ski hills visible on the tops of some the mountains), they were overwhelmed by the sheer grandeur of the glen. The peaks towered over the valley and trails we trudged along. Soon, we arrived at the King’s House, a popular inn. After being greeted by deer calmly lounging on the front lawn, we went in to grab a real lunch in lieu of our rations. Somewhat morbidly, they offered venison burgers as opposed to beef (perhaps the deer shouldn’t have been so relaxed). Anyways, we stuffed our faces and set off back into the Glen. At this point, it started to register with us that as beautiful and imposing as the surrounding peaks were, we had to climb them. This brings us to the Devil’s Staircase. With a name like that, you can pretty much assume it’s not going to be nice leisurely climb with a railing to hold on to. As we reached the start of the ascent, we could see the trail (a steep, rocky mess) slowly snaking its way up to the heavens. The climb is 550m – the highest point on the Way – and was much steeper than the other ascents we’ve had to make. With a resigned sigh, we started the climb. I quickly realized the best way to do it was to keep looking either straight forward or at my feet, without checking to see how much ground there was left to cover. I’m told there are great views to be had by looking back as you climb, but you’ll have to look that up yourselves. Finally, after the ascent into Hell (if that makes any sense), we arrived at the top. While the arrival into the Glen was awe-inspiring, our view from the top of the Staircase was even more rewarding. Rugged mountains (some snowcapped) were sprawled out in front of us. In the distance, we could see the iconic plateau of Ben Nevis (the tallest mountain in the UK). Since Ben Nevis sat right next to Fort William, this meant we could effectively see the end of our journey. As the sun began to set, we made our way into the mountains, with each turn and climb affording a better view than the last. 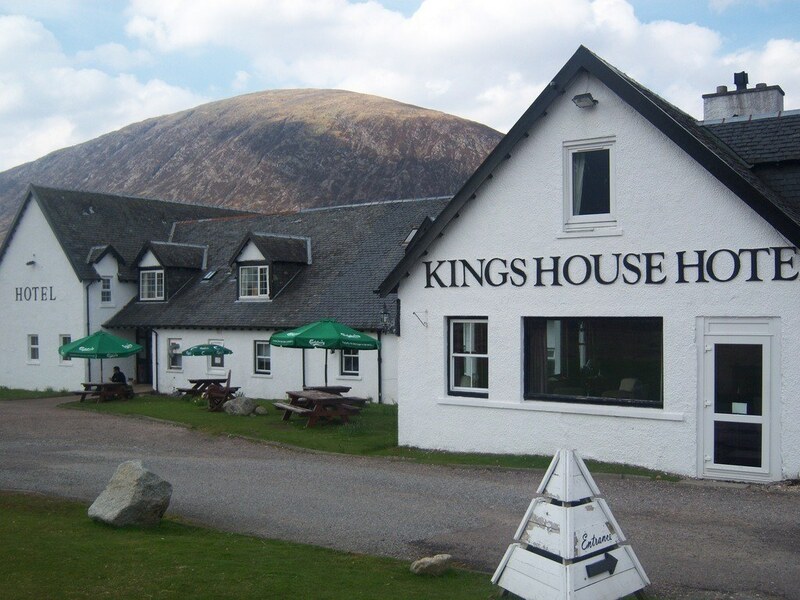 It wasn’t long before we could see the village of Kinlochleven, our stop for the night. While it appeared to be quite close, we realized that our route would descend at a gradual rate. By gradual, I mean we could see the town within our grasp for hours as we frustratingly snaked our way along the side of the mountains. The cliffs may have been much too steep to descend directly, but that didn’t stop us from considering it (note: don’t do this). Finally we arrived in the relatively large Highland village, ate, bragged to our school bartender that the Devil’s Staircase was too easy, met the friendliest hostel owner in the world, and hunkered down for another night, knowing we had just one more day to go. We started our final day off right with a full Scottish breakfast of bacon, eggs, toast, beans, tomatoes, and congealed blood (also known as black pudding). 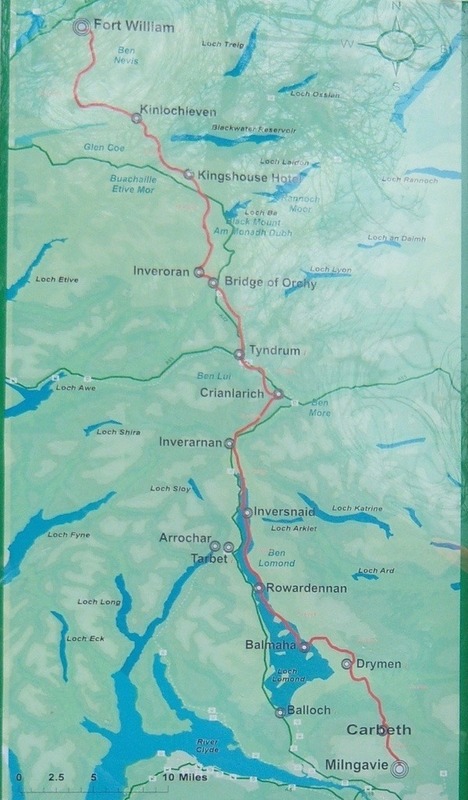 Our route was supposedly relatively short and straightforward from here to Fort William. Fully expecting to arrive in record time, we set off through the town and back onto the Way. Things immediately took a turn for the tough. That gradual descent we made yesterday for hours? Now we had to go straight back up on the other side, but this time much more directly. While this certainly saved time, it maybe wasn’t the ideal way to start the day with everyone’s breakfast still wreaking havoc in their stomachs. Thankfully, the majority of the rest of the day would be spent on relatively level ground. After the thrilling scenery of yesterday, our final leg was admittedly a bit of an anti-climax. While there were certainly interesting spots, a large amount of the trail goes through valleys or woodlands along less rugged forestry tracks. This may make the walking easier, but it felt as if we were returning to the less adventurous hiking that made up the first half of the Way. 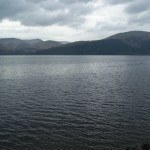 Still, the promise of Fort William and the successful completion of our journey spurred us on. We continued to play games of follow the leader with the Swedish hikers. They were now hiking together, meaning that we had now seen both the rugged and romantic side of Scotland. I don’t know what the odds of two separate hikers from Sweden deciding to walk the Way at the same time are, but there it was. We would fall behind them permanently however, when one of our number began slowing up considerably due to a sprained ankle. After deciding to take turns carrying their pack (now I know what it feels like to carry two people’s lives on my back), we soldiered on. As we started descending along the side of the towering Ben Nevis, we eventually hit an asphalt road. Somewhat suddenly, we found ourselves face to face with a sign proclaiming the end of the West Highland Way. That was it. We had done it. After all our hard… wait. On closer inspection the sign read “The Original End of the West Highland Way”. In other words, if we had done this hike however many years ago, we could be toasting to a successful finish. Instead, we saw that the actual end of the Way lay somewhere in the heart of Fort William. As we trudged forward into the busy and vibrant town, we quickly realized we had no idea where to go. We might have made it over mountains, past lochs, and across moors, but urban planning it seemed, had defeated us. Eventually, some kindly locals pointed us in the right direction and we were able to make it to our final destination. Anybody know where we’re supposed to go? This was it. We had (actually) done it. After taking the time to show in pictures exactly how we felt about our classmates who had doubted us, we grabbed our packs and, after getting lost one or two more times, found our lodging for the night. After letting our school bartender know that we had truly, once and for all, made it, we went out to celebrate on the town. After narrowing our search to a pub that served beer, we quickly found an establishment that met our needs. Toasting our success, we celebrated late in to the night, only returning to our beds after the last drop had been served. In retrospect, that wasn’t the greatest decision. See there was something left incomplete, that we couldn’t leave Fort William without doing. As I mentioned, the town lay in the shadow of Ben Nevis, which rises 1344 metres above the sea. Capping off our hike by conquering Britain’s tallest peak seemed like a poetic way to finish off what had been a truly remarkable journey through the Highlands. Unfortunately, the previous night’s celebrations meant we woke slightly later than intended (as in, after noon). To add it our problems, it was clear our friend with the sprained ankle was not in any shape to climb. Another of our number volunteered to stay behind so, after cursing our late rise, three of us rushed out the door with our packs as we had done the previous 6 days. We could see the mountain (it was kind of hard to miss) but we had absolutely no idea where the trail was. Vaguely recalling a visitor centre we passed the previous day, we set off backtracking along the road we had triumphantly paraded down less than 24 hours ago. By this point, it was already mid afternoon and time seemed to be slipping away at an alarming rate. We inquired as to the start of the Ben Nevis summit trail and were met with an incredulous look by the staff member at the centre. She told us the climb takes 7 to 8 hours and it would be dark long before we made it back down. This was enough to prompt one of us to turn back towards the safety of Fort William. After getting the location of the trail out of the reluctant staffer, myself and one other companion set off towards Ben Nevis. Knowing we had to make good time to avoid stumbling back down without a visible path, we pushed ahead, stopping only briefly for the occasional picture or chocolate bar. The first half of the Pony Trail (the most popular route) took us precariously along the edge of a lower peak. With nervous glances at the painful fall that awaited us if we strayed too far to the right, we made it to the top of Lochan Meall an t-Suidhe (also known as the ‘Halfway Lochan’), where a serene lake greeted us. Knowing we still had more than halfway to go, we continued up the west side of Ben Nevis. The trail here, and I use the word trail loosely, consisted of a jumble of rocks that zigzagged its way past other larger rocks. Eventually, the trail seemed to just give up all together as we hit the snowy upper reaches, and we were led by strategically placed stone cairns. To make matters worse, my friend appeared to be doing their best to retch up a lung. Still we persevered, and eventually the summit came into view. There was a small stone shelter, a war memorial for the Durham Light Infantry, a sign marking the summit, and… a tent. Just when we thought we had achieved something truly unique, we noticed our fellow Swedish hikers had set up camp for the night… on top of a mountain! From not knowing each other a few days previously, to finding each other on the Way, to spending the night at Britain’s highest point – some things were just meant be. Parts of the summit can best be described as unnerving. Since Ben Nevis is essentially a massive plateau, the area near the top levels out, then drops off without warning. With snow and ice covering the ground, it wasn’t quite clear where the mountain ended and the long, direct descent began. After getting as close as we dared to the edge for some nervous pictures, we prepared to set off down the mountain as the sun sank ever lower. The descent went quickly (it was the same trail after all). We could see Fort William down below in the distance through haziness slightly obscured our view. Soon enough we had made it down in what seemed like record time despite our various ailments and sores (about 5 hours total if I wanted to brag, which I do). Just because our days of hiking were behind us, the adventure wasn’t over. Our companion who had suggested the West Highland Way in the first place was keen to visit the remote town of Inverie on the peninsula of Knoydart (where their ancestors had once lived). Since the village was the site of the “Remotest Pub in Mainland Britain”, we readily agreed. This meant about an hour and half train ride to the seaside town of Mallaig. Mallaig is the main fishing port on Scotland’s West Coast as well as a gateway to the western isles (such as the famous Isle of Skye). We weren’t going to an island, but we still needed to take a ferry to reach Inverie since no roads on the mainland led there (remotest pub remember?). After a quick lunch, we hopped aboard our ‘ferry’, which consisted of a jovial guy on his fishing boat. After an 11 km trip along the coast, he dropped us off and waved goodbye – promising to bring us back the next morning. As we looked around, we could see that the pub didn’t lie. Besides said establishment, there was a post office and a couple other buildings, including a hostel but no roads leading out. We dropped our stuff in a hostel room (there was nobody else there, not even staff) and went back towards the aforementioned place of interest. Here we were, in one of the most remote places in Britain, ready to get a taste of local Scottish culture. As the door to the pub swung open, our preconceptions were quickly shattered. An entire half of The Old Forge (the pub’s name) had been taken over by a loud, boisterous group of about 15 or so Englishmen (from London judging by their accent). Yes, we might be around 900 km from the UK’s capital, but it seemed as if London had come to us. We settled in for the long haul, feasting on everything from mussels to sandwiches, and sampling every brew they had. As the night wore on, both the stag party (we found out they were all here for a bachelor party) and us grew louder and louder. The locals didn’t mind (or at least they didn’t say so), and seemed keen to fill us in on what life is like in Inverie. Finally, when we were the last one’s left; we took the hint from the bartender (who still seemed to like us somehow) and went back to our hostel. If we had a choice, we likely would’ve slept half the day. However, we had to rise early if we wanted to catch our ferry back to Mallaig. After inquiring about our say in Inverie, our ferry master took us back across the water, following which we went for a quick bite to eat. It seems the stag partiers had the same idea, as they had beaten us to the restaurant. Considerably quieter, and all sporting sunglasses and pained expressions, they all seemed to be considerably worse off than us. While we remained proud of our accomplishment, this day brought a new feeling to the table – sadness. As we boarded our train in Mallaig bound for Glasgow, it started to sink in that this was it. Soon we would disembark, spend one last night in Scotland’s largest city, then all head our separate ways. Some of us were bound straight back to Canada, another was meant to visit family in Northern England, while I was due to meet my parents back at Heathrow Airport in London. There was a stark recognition of the fact that we were almost at the end of our road, and heading south for the first time in a week only brought this fact home. Apparently, the train company saw we weren’t eager to leave, because the train ride seemed to take forever. 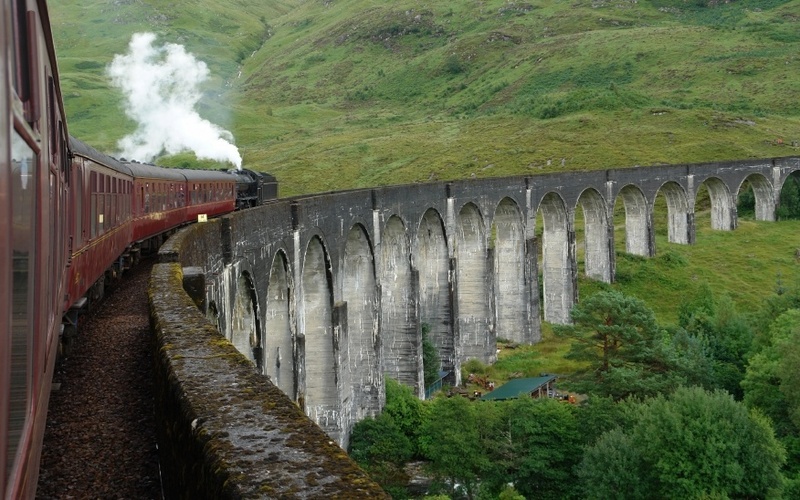 While we were travelling on the West Highland Line – made famous in the Harry Potter movies as the route of the Hogwarts Express – you can’t actually see how fascinating it looks from the inside of the train. Instead we were left to ponder just how bad we smelled, just how bad the other hikers on the train smelled, and just how loud the nearby child and the (even louder) mother was for 6 or so hours. Finally, we arrived in Glasgow. While our first impression might have been of a rainy, depressing city, today the sun was shining and people were out in force – especially along the vibrant Buchanan Street. After a team trip to a nearby H&M to get clothes we hadn’t worn for 8 straight days and a much needed shower, we set off for one last gentleman’s night out. The next morning we gathered our packs for the final time and made our way to either the train station or airport. My flight was the last to leave, so after saying goodbye to my fellow adventures until the start of next school year, I took my seat and waited for my number to be called. It began to set in just how much we had accomplished over the past week or so. From the unremarkable beginnings of attempting to catch a train to Milngavie all the way to Fort William, we had completed the West Highland Way in exactly how much time we planned on doing it. Were there hiccups along the way? Sure, but we had done it and that’s what mattered. I realized there was no other trip I would have rather made. I didn’t envy the classmates who were soaking up the sun along the Mediterranean or those getting their fill of urban life in Paris and Madrid. We might have cursed our choices (and each other) throughout our journey, but we all knew there were no regrets at the end of it. 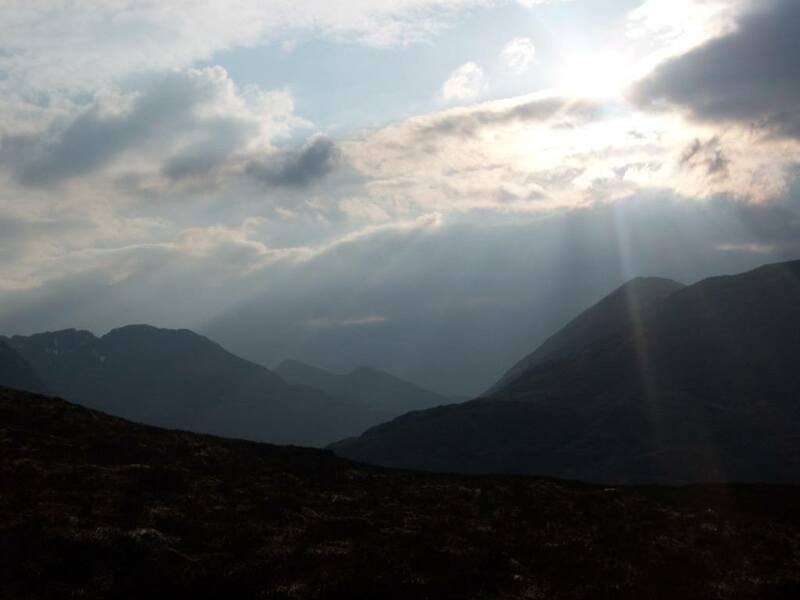 The sore shoulders, the dreary farms, the endless Loch, our less than proficient camping, the unbeatable views of Glen Coe, the ascent of Ben Nevis, the Old Forge, and even the train ride at the end – I wouldn’t have traded it for anything. Did you miss Part 1? Find it here! 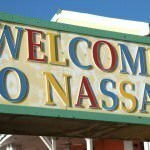 Also, check out our first Travel Diary here, which chronicles a misadventure in the Bahamas.